Click here for a full-resolution JPEG image (7.7 MB). 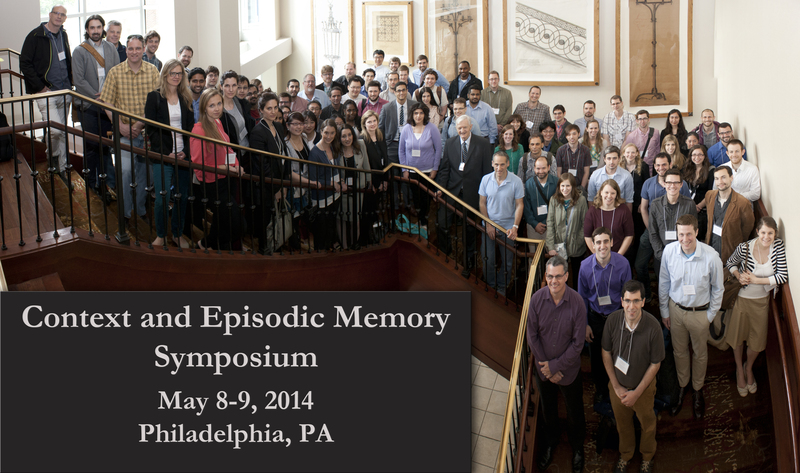 The 2015 Context and Episodic Memory Symposium (CEMS), now in its eleventh year, will be held on the campus of the University of Pennsylvania in Philadelphia, PA, on May 7th and 8th, 2015. We are pleased to announce that Dr John T. Wixted of UC San Diego will be giving the keynote presentation at CEMS 2015! Registration for the 2015 CEMS conference is now closed. This year there will be two Registration Types for 2015: $200 Non-Faculty and $300 Faculty. These registration fees will cover two days of seminars, breakfast on Thursday and Friday, beverages and small snacks during breaks, and an opening night reception. Hotel reservations can be made by using the Inn at Penn link under "Location & Hotel" below. Please use the conference code ("CEMS") for our group room rate. You will need to register on through this site for the conference, and the Inn at Penn's site for your room(s). Please click on the PAY NOW button below to pay via PayPal using your account or a valid credit card. Note: Your PayPal confirmation is your CEMS receipt, and should be used for check-in at the symposium on Thursday, May 7, 2015. Registration fees will increase $25 after April 24, 2015. Refunds/Cancellations are subject to a 10% cancellation fee. Please email context.symposium@gmail.com if you have any questions. Your registration is not complete until you've completed the registration form. please click on the 'Computational Memory Lab' link you will see below the Paypal "Successful Payment" message. The venue for the 2015 CEMS will be the Inn at Penn, located on the campus of the University of Pennsylvania. In addition to its role as venue for CEMS 2015, the Inn at Penn will serve as the preferred hotel, with group rates negotiated through April 3, 2015 (or until rooms run out). Please book your room(s) in advance of that date to ensure you receive the negotiated rate ($219 per night). To book your room(s), please follow this link, using the group code: "CEMS". Uber is a on-demand towncar service that you can summon using an app on your iPhone or Android device, or from m.uber.com, or by texting an address and city to UBR-CAB (827-222). Normal rates for a towncar are a $7.00 base fare plus $3.75 per mile, or $0.85 per minute of wait time, with a $15 minimum fare. SUV rates are higher. You must create an account first. Sign up using this CEMS link and receive a $10 bonus credit towards your first ride. Taxi fare between Center City Philadelphia (including Penn campus) and the airport is $28.50 each way for one passenger. For trips to Center City from the airport, there is an additional $1 fee per passenger. Most cabs hold up to 3 people. The airport is served by SEPTA's Airport Regional Rail line, which stops at each terminal. In Center City, you may use either the University City or 30th Street stops on the Airport line. Tickets are $7.00 per person each way. The train is scheduled to run every 30 minutes. The trip takes 15-20 minutes depending on terminal, and the weekday schedule may be found here. SEPTA's trolley and bus lines connect at 30th Street Station and cost $2.00 (exact change only, or you may buy tokens). The Inn at Penn offers valet parking Charge at $39.00 for overnight parking with in and out privileges and 20.00 for daily event parking (prices subject to change). More information about the University of Pennsylvania and its environs will be available soon. Normal base rate is $2.25 cash (exact change only), or a token. More information about fares can be found here. Submit an abstract for consideration to give a spoken presentation at the 11th Annual Context and Episodic Memory Symposium (CEMS) to be held on May 7 and 8, at the University of Pennsylvania in Philadelphia, Pa. The symposium is designed to be a forum for the exchange of ideas among colleagues working on theoretical and empirical approaches to the study of context and episodic memory, broadly construed. The format of CEMS is to have a relatively small number of spoken presentations each followed by a commentary given by a scientist working on related problems. The program committee aims to identify submissions that highlight major new theoretical and/or empirical advances. Papers not selected for these spoken presentations can be given as poster presentations. In previous years, posters have been a major highlight of the meeting and have been very well attended. The Bennet B. Murdock award will be given for the best poster or spoken presentation by a young investigator, as determined by the committee. Please email abstract paper submissions to Katherine Hurley (research coordinator of the Computational Memory Lab at the University of Pennsylvania) at context.symposium@gmail.com by Friday, January 23, 2015. We would encourage submission of a written description of work in addition to an abstract if such a description is available. Full-length: 27-minute talk, followed by up to eight minutes of questions, and a ten-minute commentary. Intermediate-length: 16-minute talk, followed by up to four minutes of questions. Please either have slides ready to load onto the presentation computer (a Mac with the latest versions of PowerPoint, Keynote, and Adobe Reader) in the morning before your talk, or bring your own computer, with whatever adapters you will need to output a VGA signal. We will have the capability to output sound from the computer, but please let us know ahead of time to prepare for that. We will have easels, foam core boards, and thumbtacks available for poster display. Please limit posters to 40x60" at most. Donna J. Bridge, Joel L. Voss (Northwestern University): How are episodic memories structured? If you are presenting and have schedule conflicts, please let us know by emailing context.symposium@gmail.com as soon as possible. Kylie H. Alm, Ashley Unger, Tehila Nugiel, Hyden R. Zhang, Tyler M. Rolheiser, Vanessa Troiani, & Ingrid R. Olson:Frontal White Matter Connectivity Predicts Variability in Associative Learning and Delayed Retrieval. Mariam Aly and Nicholas B. Turk-Browne:"Hippocampal representations of attentional state predict the formation of episodic memory"
Suyog Chandramouli, William Kronenberge & David Pisoni :"Performance of Prelingually Deaf Adult Cochlear-Implant Users on California Verbal Learning Test-II: Some Preliminary Findings"
Avi J.H. Chanales and Brice A. Kuhl: "Hippocampal Activity Patterns Differentiate Between Overlapping Routes"
J.DiLascio, P.Sederberg & M. Howard :"Modeling Semantic Transitions in Free Recall"
Sarah DuBrow, Brynn Sherman & Lila Davachi: "Opposing influences of event boundaries on judgments of time"
Chad J. Gossett, Adam E. Hasinski, Per B. Sederberg: "Electrophysiological Correlates of the Context Repetition Effect"
Benjamin J. Griffiths, Simon HansImayr: "The relative importance of spatial and temporal context for episodic memory in real world environments"
Hebscher, M., Abramski, M., Goldsmith, M., Aharon-Peretz, J., Gilboa, A.: "Memory, decision-making and the ventromedial prefrontal cortex (vmPFC): The roles of subcallosal and posterior orbitofrontal cortices in monitoring and control processes "
Pernille Hemmer and Kimele Persaud: "Episodic Memory across Cultures: From Students in the US to the Tsimane’ People of Bolivia"
William J. Hopper, David E. Huber: "The Short-Term Cost of Retrieval Failure"
K. Kato and J. Caplan: "Do association-memories include constituent-order?" Ghootae Kim, Kenneth A. Norman, & Nicholas B. Turk-Browne: "How context memories are updated based on competition"
James E. Kragel and Sean M. Polyn: "Large-scale network activity predicts the maintenance and retrieval of contextual information in memory"
Lynn J. Lohnas, Katherine Duncan, Thomas Thesen, Orrin Devinsky, Lila Davachi : "Mnemonic processing in hippocampus and dorsolateral prefrontal cortex"
Michael Mack, Bradley Love & Alison Preston: " The evolution of category knowledge: Linking learning models to the dynamics of neural representations"
Christopher R. Madan: "Adaptive memory: Considering the functional role of memory"
Neal W Morton and Sean M. Polyn: "A predictive framework for evaluating models of semantic organization in free recall"
Dylan M. Nielson, Per B. Sederberg: "MELD: Mixed Effects for Large Datasets"
Patrick Sadil, David Huber, Rosie Cowell: " Visual Recollection"
Sekeres, M.J.,McKelvey, K., St.Laurent, M., Pishdadian, S., Winocur, G., Grady, C., Moscovitch, M.: "Time-dependent transformation of complex memory episodes: rescuing and preventing loss of memory for detail"
Brian M. Siefke, Per B. Sederberg :"Violations of visual rhythm enhance subsequent memory for words"
Inder Singh, Aude Oliva, Marc Howard : "Visual memories are stored on a Weber-Fechner timeline"
G. Ward and C.Cinel: "RECALL: Retrieval-induce forgetting in the real world"
Emily R. Weichart, Dylan M. Nielson, Per B. Sederberg: "Inter-subject correlation in theta and gamma spectral power predicts memory for details of scientific talks"
Jamal A. Williams, Ida Momennejad, Jonathan D. Cohen, Kenneth A. Norman :"Taking the same pill twice: the role of context reinstatement in commission errors"
For information about previous years' CEMS, please click here. This page was last modified on 4 April 2016, at 11:28.